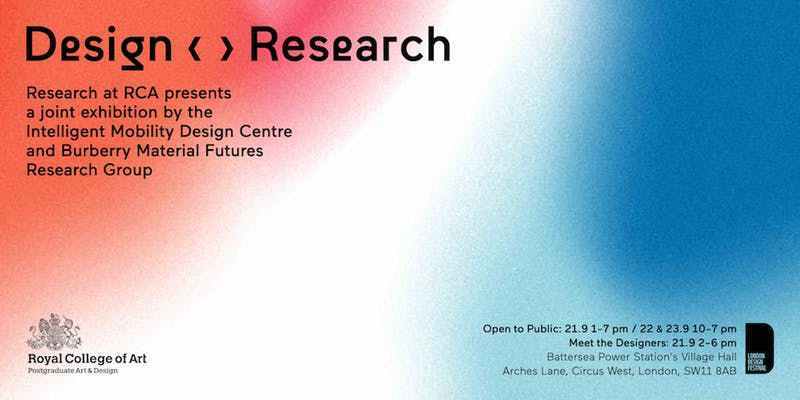 As the RCA evolves into a STEAM (Science, Technology, Engineering, Art and Mathematics) focused postgraduate university, visitors to Design <> Research will discover how these research centres are applying this cross-disciplinary way of working to create real-world impact. As we rapidly enter the Fourth Industrial Revolution, physical and digital challenges call for art and design to be fully integrated alongside the traditional STEM fields of Science, Technology, Engineering and Maths. So, at the beginning of a collaborative project to answer a research question, the Burberry Material Futures Research Group and the Intelligent Mobility Design Centre both place artists and designers alongside scientists and engineers from the start, therefore laying the foundation for a more connected future in which dynamic design concepts help us to navigate complex reality. Burberry Material Futures Research Group Spanning research in sustainable materials, future manufacturing, consumer experience and product interaction, the Burberry Material Futures Research Group combines design-led innovation with expertise from engineering and bio-science. The BMFRG takes a systems approach to materials research, thereby proposing new realities that re-couple use of materials resources to human wellbeing and economic development in order to help society transition to a more sustainable existence. The systems approach integrates three main themes: Sustainable Future Materials, Sustainable Future Manufacturing and Sustainable Future Consumer Experience. This exhibition and symposium will disseminate the insights from the Group’s scoping project, which is Phase 1 of its operation. The scoping project was undertaken by experts, who reviewed current developments in the different topics in the themes. In 2017 the Burberry Foundation awarded £3 million to the Royal College of Art to establish the Burberry Material Futures Research Group — the first of its kind in the world — alongside an expansion of the Burberry Design Scholarship to support more than thirty students from 2017 to 2023. The Burberry Material Futures Research Group applies radical thinking to invent new sustainable materials, transform consumer experience and advance manufacturing to benefit the whole industry and wider community.